Simple, productive, comfortable, reliable with incredible dust control. The Advance Proterra™ is the ideal solution for industrial sweeping applications from factories to warehouses, parking garages to foundries and many more. 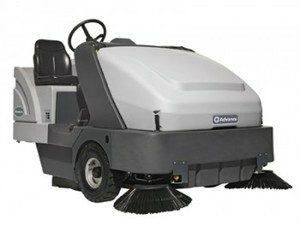 The unique design makes fast work of sweeping a facility with its large cleaning path, excellent maneuverability and high capacity hopper. An ergonomic operator interface and the unique Clear-View sight line of critical sweep areas ensures hours of safe and comfortable sweeping. The Advance Proterra comes equipped with DustGuard, part of the DustClear Five-stage Dust Control System. Unlike conventional mechanical broom sweeper technology, DustGuard addresses dust at its greatest source the side brooms through a fine fog that is applied to suppress the dust. The result is a dust controlled sweep path that is 75% more productive than its nearest competitor.